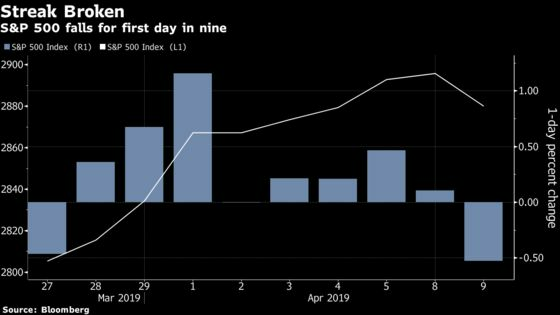 The S&P 500 fell for the first time in nine sessions as the Trump administration threatened tariffs on the European Union and the International Monetary Fund cut its global growth outlook to the lowest since the financial crisis. Multinationals bore the brunt of the selling, with Caterpillar and Boeing dragging the Dow Jones Industrial Average lower. Airlines tumbled along with materials and energy producers. Ten-year Treasury yields fell below 2.50 percent, while the greenback was mixed against major currencies. The pound dropped as the EU looked set to force the U.K to delay Brexit for as long as a year. The S&P 500 Index fell 0.6 percent to 2,878.24 as of 4 p.m. New York time, the most since March 22. The Dow Jones Industrial Average fell 0.7 percent. The MSCI Asia Pacific Index gained 0.4 percent. The MSCI Emerging Market Index rose 0.4 percent. The euro was steady at $1.1263. The Japanese yen increased 0.3 percent to 111.12 per dollar. The British pound fell 0.1 percent to $1.3054. The MSCI Emerging Markets Currency Index advanced 0.2 percent. The yield on 10-year Treasuries sank two basis points to 2.49 percent. Germany’s 10-year yield declined two basis points to -0.01 percent. Britain’s 10-year yield dipped two basis points to 1.099 percent. The Bloomberg Commodity Index fell 0.2 percent. West Texas crude fell 0.5 percent to $64.05 a barrel. Gold gained 0.5 percent to $1,308.10 an ounce.